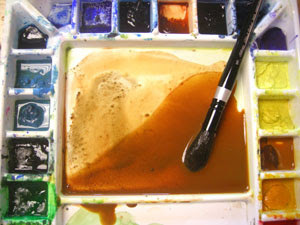 Today I am going to add some Burnt Sienna to the puddle of yellows that I used yesterday. Again I want to work in the largest basic washes first, so I will paint a foundational layer of paint for the table. I mix a large puddle and use lots of water. The wetter the wash the nicer it will flow when applied to the paper. Because I work very wet, there is usually a bead of paint at the end of the wash. 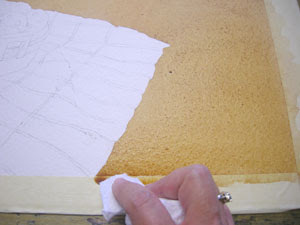 I use a piece of paper toweling to gently rub along the taped edge of the painting. You can also just touch the paper toweling to the puddle, without even touching the paper. This will siphon off the extra liquid so that it will not run back into the wash and create a bloom. Paint the largest areas first, then go back and paint the table where it shows through the jar. Because the glass will distort the line, it should not line up perfectly with the normal view of the jar.